While enchanting views set the stage for this couple’s wedding, their love filled the air with magic. Karishma and Sandeep had adjoining desks at work. A few years later, their seating was shuffled but despite their desks moving farther apart, the two came closer together. The bride shares their story and details of their wedding along with photographs by the Going Bananas Photography team who are now part of the family. We sat next to each other at work for a few years and despite or maybe because of our heated debates, we got to know each other’s worlds quite well. Eventually we moved on to different projects but our paths continued to cross and eventually we were inseparable. For the wedding, we wanted a romantic, intimate venue in a natural surrounding. Villa Medicea di Lilliano was the location of our dreams. Its surroundings are spellbinding and their décor was unmatched. All we needed for the celebration was to be surrounded by the people we love and to dance the night away. Our mehndi was held at Villa Toricella, Bagno Ripoli. Prasheila and Abhimanyu from Going Bananas Photography were in charge of capturing all the special moments and are now officially our family photographers! 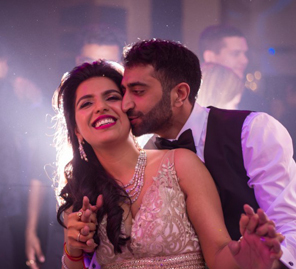 They covered Sandeep’s sister’s wedding in Jaipur and we were more than excited to have them in Florence for ours! 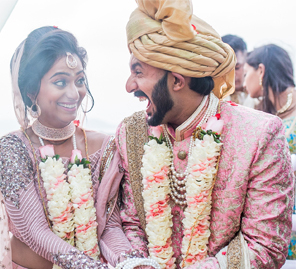 They’ve endeared themselves to our entire families and having spent three days with them at the wedding in Jaipur, there was a sense of familiarity when we reconnected in Florence, four days before the wedding. They spent nearly every waking moment hanging out with us, joking with our mums, and capturing moments we will treasure forever. Despite the levels of trust, Going Bananas Photography maintained a professional protocol – they took down our brief, kept us appraised of what was feasible and what wasn’t and were always in touch. Their formidable experience as photographers even helped us structure the wedding. Given how far we deviated from tradition during the wedding, they were both incredible at reminding us of the little traditions which kept the older generation content. We’d describe Prashila and Abhimanyu with every cliché adjective of praise you’d expect, so take that as a given. What ultimately mattered was their passion, their personalities and their dedication to us and our families. It was clear that they wanted to meet all expectations and that too, with a smile on their faces. 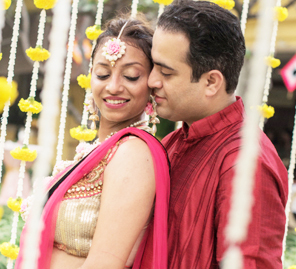 We love Prasheila and Abhimanyu, and look forward to finding excuses for them to take pictures of us in the future! Evolution Print & Design Ltd were incredibly professional and covered everything from invitations, seating plan, menu to the Hindu ceremony guide. We wanted something different from the traditional Indian artefacts, and the team understood our vision and created unique new templates that resulted in something incredible. Everything was delivered on time, despite last minute changes. (This can happen with your table plan!) They paid attention to every aspect, from the design, layout, format, materials – the quality and results were truly amazing and better than we could have imagined. We couldn’t have done it without them. Credits go to Poonam, Vipul and Girish Naker. We highly recommend using their services. My wedding outfit was designed by Arinder Bhullar. She is a passionate artist who has a great boutique in the city centre. On one of my multiple visits, I explained that I didn’t want the traditional red bridal outfit. So she worked with me and using details from other pieces and some of my own personal requests, she created a beautiful outfit that was delivered on time, fit perfectly and received compliments from all our guests. Arinder has an amazing aesthetic and is an integral part of the process once you step into her store. She undoubtedly is a great designer. The mehndi was our first event and we wanted it to be a fun, icebreaker for the guests. It was hosted by a pool and our guests were plied with pizza and beer. And there’s a great story here about our photographers. Our friends were out there, calling people to the dance floor and eventually he got to Abhimanyu and Prasheila. They just slung their cameras on their hips and hit it right there, bringing India into the middle of Italy! Then Sandeep got thrown into the pool, followed by his friends and Abhimanyu dived right in behind them, expensive camera gear in tow, not to miss a moment! Talk about being in the centre of the action at all times! I wore a dusty pink gown with white detailing to our civil ceremony the next morning. As I got ready, Prasheila was there with me and my family. Those are the first photos I’ve printed and framed, they have pride of place. The function was held outdoors, with beguiling views of the city. The décor was subdued to allow the beauty of the venue to stand out. When I stepped out to see how wonderful the weather was, I knew that we had made the right decision. Our Hindu ceremony was hosted outdoors. A mandap was created using pink and white drapes and was set up against uninterrupted views of lush green hills. For this function, I wore a green outfit while Sandeep opted for a golden sherwani. Once the ceremony was over, there were a few games for both of us which we had a blast playing as our loved ones cheered us on. Be very selective with the partners and vendors you get on board. Do background checks and look for references online and offline. Going Bananas Photography, Evolution Print & Design Ltd and Arinder Bhullar were definitely our favorite partners.